Room features a queen-size bed or 2 twin beds, single convertible sofa, wall pull-down bed (if sleeping 4), split bath with tub and shower. 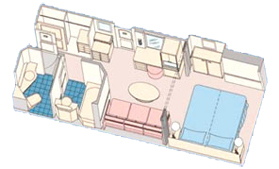 Category 10 rooms are on decks 1, 2, 5 & 7. Decks 1 and 2 offer convenient access to restaurants and nightclubs. Deck 7 is an upper deck with more commanding views. There are six category 10 rooms that have an obstructed porthole, and used to be category 9 but were changed to category 10 because of the obstructed view. They are rooms 5020, 5022, 5024, 5520, 5522 & 5524.